support. The set comes with three mini rubber basketballs and a ball pump. 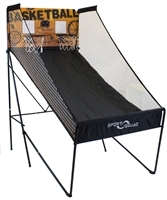 The Free Throw Dual Basketball Game comes with hoops that are manufactured from 10mm cold-rolled, powder-coated steel rods and are reinforced with cross braces to simulate real hoops action. The battery operated scoring unit counts down from sixty seconds and awards two points for the first half of play and three points for the remaining half. The Rhino 9' Platinum Shuffleboard features a solid play surface with poly-coated top smooth, fast puck action. The laminated cabinet and pedestal legs with leg levelers provide optimum stability and level play. Includes all accessories needed for play. Dimensions: 29in L x 21in W x 31in H / Weight: 184 lbs. Features Authentic Joystick and Controls Just Like the Original! The Namco Pac Mans Arcade Party Cocktail Game Cabinet celebrates Pac-Mans 30th anniversary with 12 of his classic arcade game friends! This arcade-style cocktail cabinet is pre-loaded with 13 of your favorite games from the past! Enjoy the chomping fun of Pac-Man and Ms. Pac-Man or shoot down your enemies in Galaxian, Galaga and Galaga ft88. Other classic games include Dig Dug, Rally-X, Mappy, Xevious, Rolling Thunder, Dragon Spirit, and Bosconian. The cocktail cabinet features a durable wood design with a bright 19in color monitor. An authentic joystick and controls play just like the original game! The Namco Pac-Mans Arcade Party Cocktail Game Cabinet is sure to become the centerpiece of any home game room. Dimensions: 68in H x 24in W x 33in D / Weight: 300 lbs. Both Sides of the Durable Upright-Style Cabinet Include Classic Arcade Images! The Namco Pac-Mans Arcade Party Coin-Op Upright Game Cabinet celebrates Pac-Mans 30th anniversary with 11 of his classic arcade game friends! This arcade-style upright cabinet is pre-loaded with 12 of your favorite games from the past! Enjoy the chomping fun of Pac-Man and Pac-Mania or shoot down your enemies in Galaxian, Galaga and Galaga ft88. Other classic games include Dig Dug, Rally-X, Mappy, Xevious, Rolling Thunder, Dragon Spirit, and Bosconian. The upright cabinet features a durable wood design with a bright 26in color monitor. An authentic joystick and controls play just like the original game! The Namco Pac-Mans Arcade Party Upright Game Cabinet is sure to become the centerpiece of any home game room.